Hereford chairman David Keyte says that the club's prospective takeover by an unnamed bidder would involve representation from the current board. "They've done their due diligence and they're almost there," Keyte told BBC Hereford & Worcester, ahead of closing a deal which he hopes can be concluded before the Conference AGM on 6 June. "There will be some structure with the current board still performing roles. "We're a little out on a limb. We're a bit different in many ways." Keyte added: "We discussed that it might be prudent to keep some local representation, as they can't be there to do the job daily, and that has been accepted." Ground: The Bull's Edgar Street home costs an estimated annual £100,000 to run. Playing staff: Last year's playing budget for Hereford was around £400,000, ranking them 16th of the 24 clubs in the league in terms of expenditure on squads. The vast majority of Hereford players were on 44-week contracts - so were effectively out of work from 1 May. 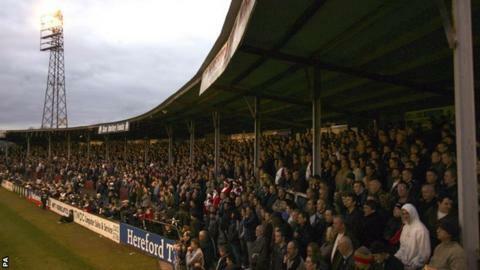 Hereford's board of directors spoke to both of the club's two main fan bodies, the Hereford United Supporters' Trust and the longer-established Hereford United Independent Supporters' Association, with regard to their proposed takeover. But Keyte has remained insistent throughout the consultation process that outside investors could provide a better deal - and he has spoken to three prospective groups looking to take over the club - none of whom are local to Herefordshire. They are also "at an advanced stage" of talks with Herefordshire Council over property development opportunities at both ends of the club's council-owned Edgar Street home. "The opportunity for somebody is the development of the ground and they will make money at that," added Keyte. United still effectively have to find approximately £225,000 by 6 June or they face being thrown out of the league. That includes £70,000-£80,000 owed to Revenue and Customs and a sum of approximately £30,000 owed to other clubs, from whom the Bulls loaned players during the season, as well as members of the current squad who are owed wages. But HUST have already revealed that they have backers who would clear that £225,000 debt. Hereford are still expected to start next season in the Conference Premier after their remarkable final-day relegation escape when, at grounds 230 miles apart, two goals went in almost simultaneously to send Chester back down to Conference North and keep the Bulls in the top level of English non-league football.